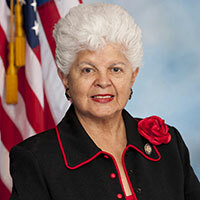 Congresswoman Grace Flores Napolitano was born in Brownsville, Texas. After high school, she married and moved with her husband to California where they raised 5 children. She began her political career in 1986 as a member of the Norwalk City Council, and in 1989 Napolitano’s fellow council members selected her to serve as Mayor. During her tenure, she addressed the city’s need for jobs and reliable public transportation. Napolitano was elected in 1992 to the California Assembly, where she quickly earned a reputation as a hard worker and champion for international trade and economic expansion, environmental protection, transportation, immigration, small business, and women’s issues. First elected to Congress in 1998, Napolitano serves on the House Committee on Transportation and Infrastructure and is currently the Ranking Member on the Subcommittee on Water Resources and Environment. She also serves on the House Committee on Natural Resources and is a long-time promoter of conservation, water recycling, desalination, and groundwater management as solutions to Southern California’s water needs. Napolitano is the founder and Co-Chair of the Congressional Mental Health Caucus as well as the Congressional Youth Challenge Caucus and a member and former Chairwoman of the Congressional Hispanic Caucus. She continues to dedicate herself to improving the lives of returning veterans and their families, standing up for labor unions, bringing sustainable water solutions to Southern California, and improving mental health care for all. Napolitano has served the people of Los Angeles County for thirty years and is currently in her tenth term in Congress.